The Pterophyta are the second largest division of the plant kingdom. There are 20,000 species of ferns compared to about 250,000 flowering plants alive today. Most ferns are herbaceous plants such as Polypodium virginianum (right) which grows in Ohio on damp rockfaces. Among the ferns we see the first major elaboration of leaf morphology, accounting for a large part of their interest for us. Petiole and lamina are differentiated as they are in higher plants and the ferns show all possible variations on compound leaf structure. Fossil leaves from Carboniferous rocks are immediately recognizable as a ferns. 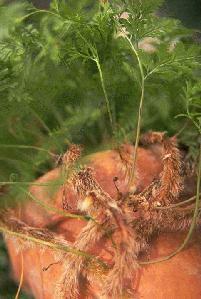 The herbaceous ferns have a rhizome (with adventitious roots). From this arise the leaves which typically begin rolled up as croziers or "fiddleheads". The fiddle heads of the ostrich fern (Matteuccia struthopteris) can be eaten as a vegeatble. Ferns are usually homosporous and the sporangia often develop in a sorus covered by an indusium (not present in polypodies). Sori usually develop on the underside of leaves as spots or bands or along the leaf margin. In some species they occur on specially modified leaves. Typically a sporangium has an "annulus" with horseshoe thickened walls. Meiosis will occur in the internal cells or tapetum of this structure to form spores. Some of the cells in the annulus are unthickened so that as the sporangium dries out they break to release the spores. The spores germinate to produce the haploid gametophyte or prothallus. For the typical homosporous fern the gametophyte is bisexual. It produces archegonia, each containing a single egg-cell and antheridia which release many motile sperm. The prothallus can only survive if water is continuously available and fertilization requires water for the sperm to swim to the archegonia. The result of fertilization is a zygote which grows out of the prothallus into the new sporophyte. Fern propagation from spores is a rather uncertain process, although some ferns seem to be able to spread all over a greenhouse without too much trouble. Much of the time ferns reproduce vegetatively. Although living ferns are mostly herbaceous, terrestrial plants there are tree-like plants, aquatics and epiphytes. Most species are tropical, although ferns are a component of all but the driest ecosystems on earth. For us they are mainly ornamental plants both in the landscape and as indoor plants. The bracken fern, Pteridium aquilinum is one of the most troublesome weeds of pasture in Northern latitudes.